The General Secretariat of the Conference offers the participants of the 7th International Conference on Conservative Management of Spinal Deformities, hotel rooms at special prices during the period from May 8 to May 12, 2012. Participants are advised to book rooms as early as possible, since rooms will be reserved on a first come/first served basis.
. 100% payment in advance will be required in order to guarantee the reservation.
. After April 30th 2012 the availability cannot be guaranteed.
. Allotments at the Hotel are for the dates of the events (May 8-12, 2012). Previous days or late departure reservations are subject to hotel availability.
. Special needs cannot be guaranteed, however we’ll do our best to honour all requests.
. A confirmation letter will be sent once reservation is confirmed.
. All prices include breakfast and VAT 10%. * Rates per night, breakfast and 10% VAT included.
. Cancellations and/or changes should be made in writing exclusively to NH Hotel.
. For the cancellations received before March 26th, 2011, there will be no cancellation charges less 30,00 Euros per room cancelled as handling fee.
. Cancellations received between March 26th, 2011 and April 15th, 2011 will apply a cancellation fee of 50% of total stay.
. Any cancellation received after April 15th 2011 will apply a cancellation fee of 100% of the total of the stay.
. No shows will be released automatically by the hotel at 09.00 AM on the following day, and the full payment will not be refundable. The hotel is enabled to charge the total amount of the whole stay. 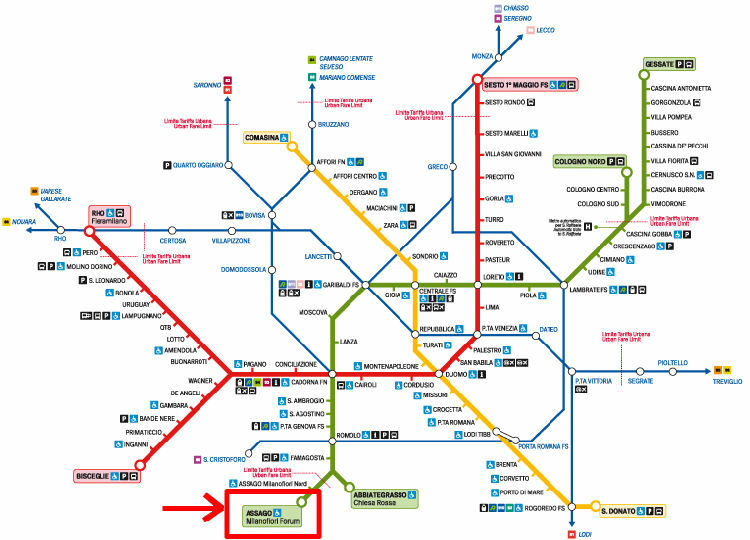 The meeting location is close to the underground station of Assago Milano Forum, which is at the end of the green line as you can see in the map you can see below. Therefore, if you want to choose any Hotel in Milan, you can move by underground to reach the meeting site.